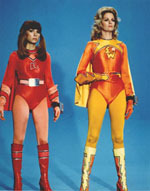 Electra Woman (Deidre Hall) and Dyna Girl (Judy Strangis) are gorgeous superheroines who battle a bevy of costumed villains. They happen wear skintight outfits with capes and operate out of the secret Electra Base, which is headed by Frank Heflin (Norman Alden), who designed and built the heroines' sophisticated equipment. All 8 episodes are now available in great picture quality.